Chickenfoot is headed To Theaters... Movie Theaters that is. 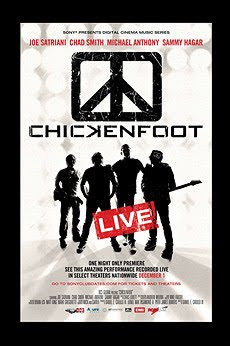 Here is the official word: Come experience the very first filmed live show of the new rock collaboration Chickenfoot. Yes, Chickenfoot! In Theatres on December 1st. Don't miss one of the greatest rock music collaborations of all-time live in Full HD and 5.1 Surround Sound coming to select theatres on December 1st, 2009!